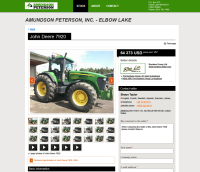 Your company needs a simple, effective webpage to present its services and stock of used equipment and trucks for sale online? Reduce the maintenance/programming responsibilities; Mascus maintains your webpage! Mini web has been developed specifically for smaller companies who do not have the resources to maintain a website; Mascus can do it for you! With this solution your company will be presented with a great looking and up-to-date website that will be available from all platforms, including desktop and mobile. You can include your company logo and choose your own colours. A company description as well as contact details including map and a contact form will be added at the same time.